Will it work? Only one way to find out….. Thanks for popping in. No kisses today! Best stay away! I is chock full – and it’s gone straight to the chest – via the ears nose and throat! Lovely. Bloody lovely. Feels like I’ve been hit by a truck. But I haven’t; it’s nothing that a load of vitamin C and zinc won’t sort out. Been prepping for next Sunday’s TV all day. I have a feeling that Old Man Time may get tight this week, so best to tick a few boxes. 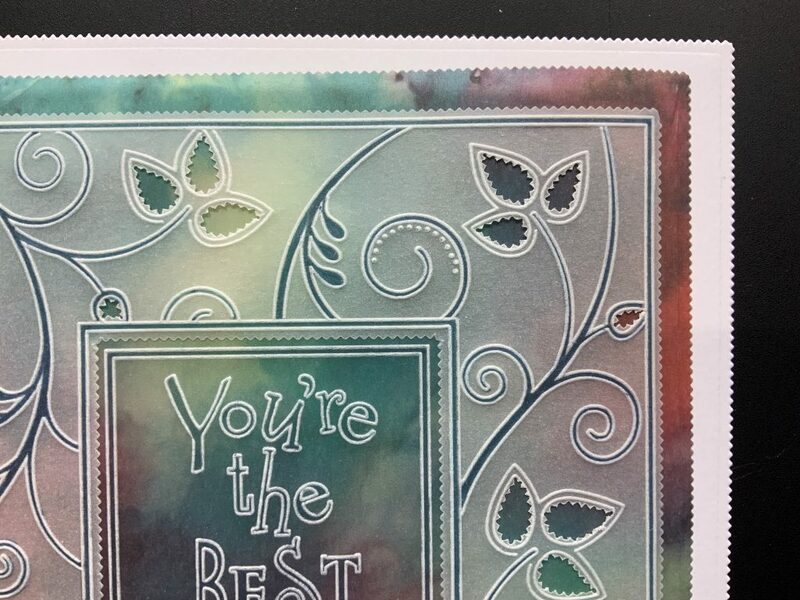 It came together well; now I know what I’m doing, I’m really looking forward to the 2-4pm show on Hochanda ! I shall be showcasing a few things which are new and very good too. I was working on the Groovi Demo, and hit a wall with the assembly. All the usual solutions weren’t really ideal, said the perfectionist. The brads are beautiful, but not on this occasion. Perga Glue works really well, but not on this occasion. The corner punches might do the trick, but I haven’t got any here. The Glue runner will show through the clear parchment I have used. The 3mm red liner tape is too thick. 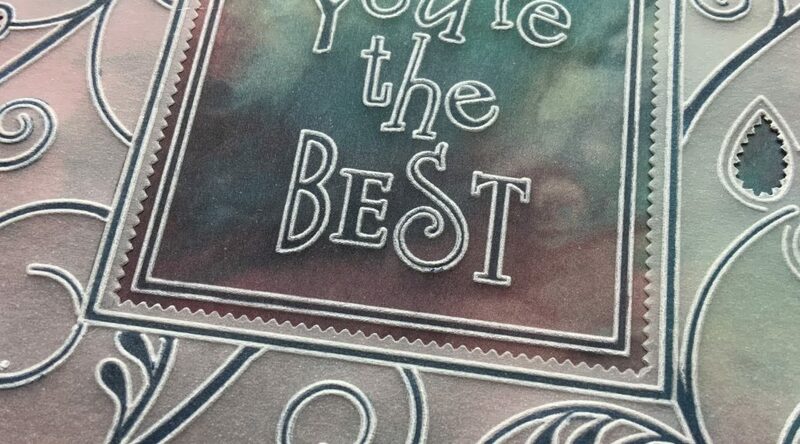 Mmmmm….. but what if I cut the 3mm adhesive down the middle, and made it 1,5mm wide…. 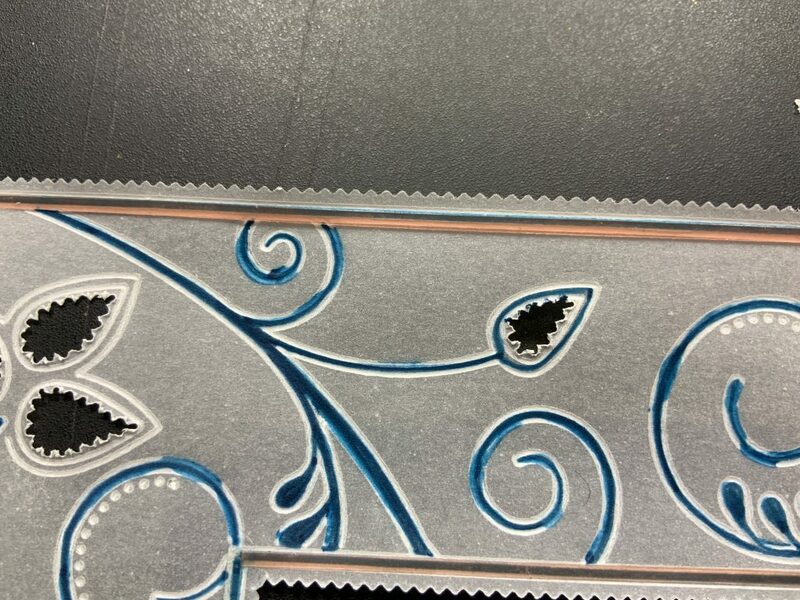 So I ran a Perga Colour pen along a ruler in the gutter around the outside and the inside edges. I know, I know. I’m supposed to do all the colouring in BEFORE perforating and cutting. I’m supposed to go to church on Sundays and not work either. 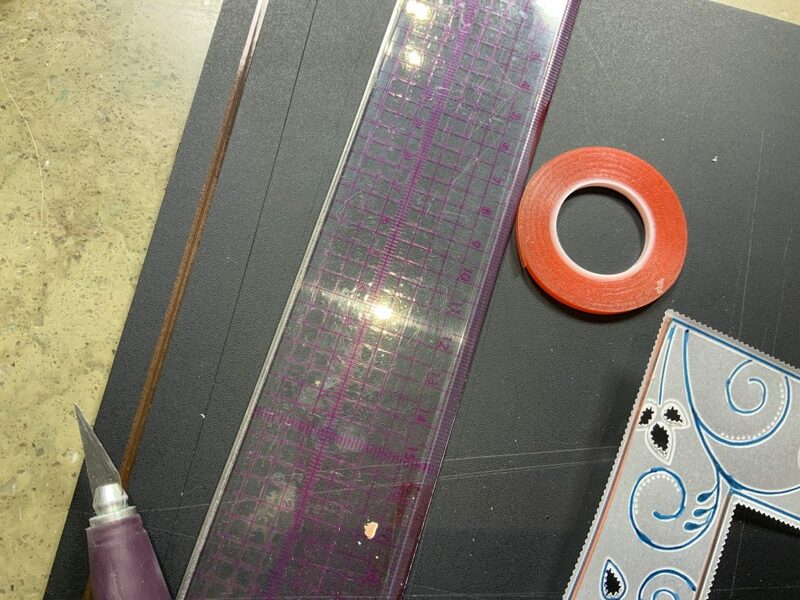 Then I lay a length of the 3mm tape down on the hard side of my Groovi Craft mat. STRAIGHT. Placed the steel edge ruler so my cutline would hit the centre, and ran my craft blade down the entire length. Simples. And what a simple solution. I bet that all you parching experts out there have been doing this for years, right? Well, good for you! It’s so thin you can’t see it from the front. But it sticks better than anything else for sure, and holds the top layer completely flat. Eek! Look at the state of that colouring in! Yuck! Colouring in from front bellisimo. 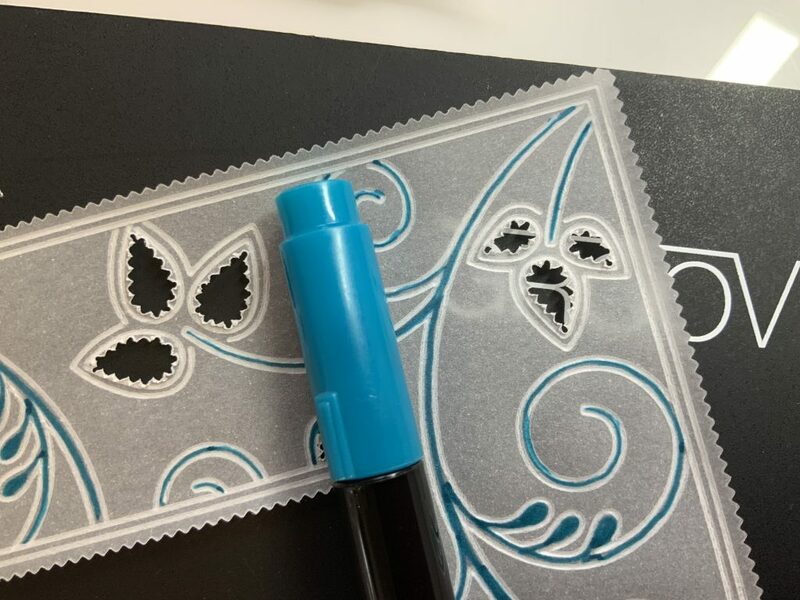 So I hope you can join me next Sunday for a 2-hour arty crafty session on HOCHANDA. Building the bridge between Art and Craft. It’s an Ellava Stencil of the Month! Last Orders please! So do I and I have a tremor! Fun fun fun. Hope you are feeling better soon Barbara. I finished my last 4 projects today. Looking forward to next Sunday. I’ll have to put the afternoon shows on to record as I’ll be at Maria’s class. The red tape comes in various widths and I have been using the very narrow rolls for ages on any parchment project with a coloured square/rectangular border as I cannot get to grips with slicing the wider tape. Love this taster of what is to come. Very surprised you managed it if you are feeling so rough. Here’s hoping it doesn’t last as long for you as it has for us. People seem to have varied reactions to this particular bug. No kisses from us either but a hug from Dave will make you feel better. I’m looking forward to next weeks shows and will be watching with a cuppa in hand. Good evening Barbara! Lots of fluids and plenty vitamin C… And if you feel bunged up inhale steam. You can also put vick on your feet and put socks on before you get into bed… Works wonders!!! 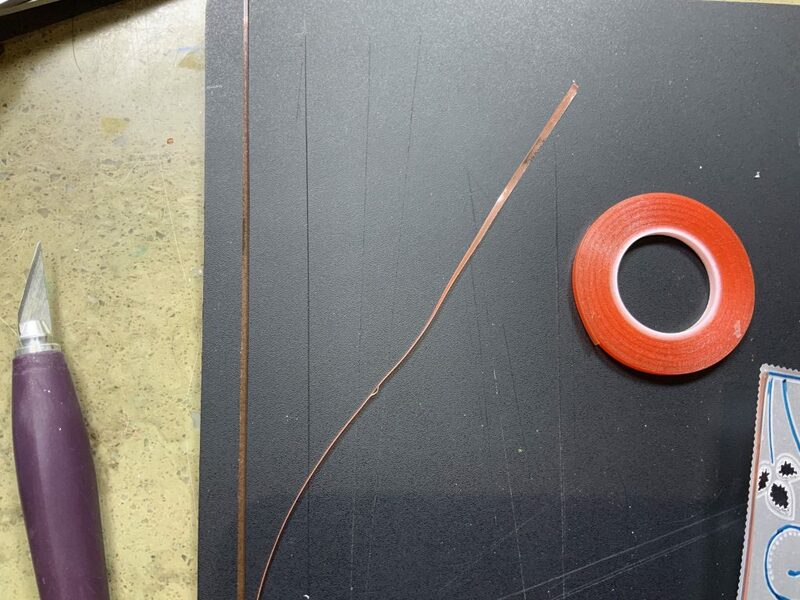 Red line tape is brilliant and that’s a neat trick of yours to cut it in half. I usually make the border wider!!! Haha! My projects are ready for posting tomorrow. Really looking forward to all the shows on Sunday /Monday. Hope you are tucked up in bed now, sorry to hear you are feeling poorly. Oh this parchment work is lovely and the red liner tape works well. I’ve not tried that, I do struggle to try and attach things. I colour in blocks, put tape runner behind it, think it looks ok then see it the next day and it’s not so good. Hope you feel better soon. It doesn’t come thinner than 3 mm does it? Barbara, I recommend Vitamin C and Echinacea to help your cold, oh and drink lots of water. Hope you feel better soon. Looking forward to next Sunday’s shows. Hope you’re soon feeling better, Barbara. Make sure you wrap up well when you go out – there’s another cold snap on the way. I do hope you start to feel better soon, these cold bugs really can be annoying. 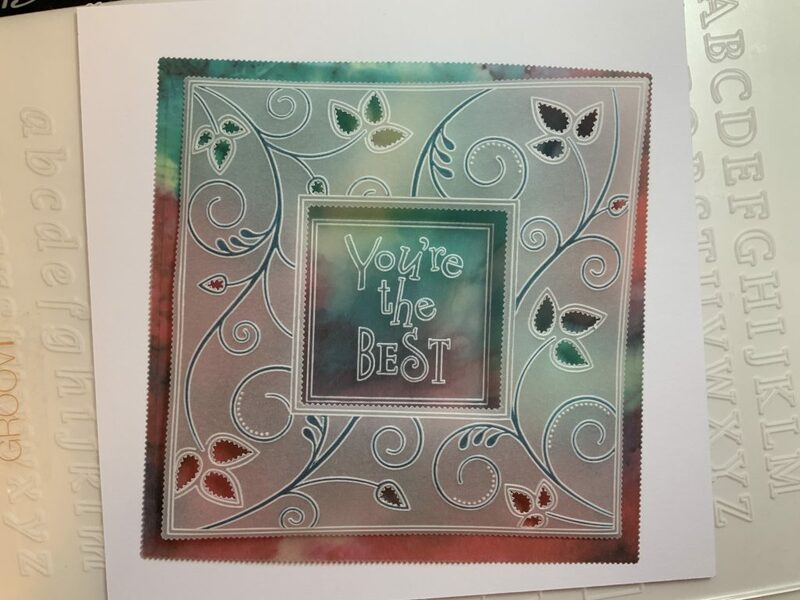 I think that you deserve to give that card that you made to yourself as “You’re the Best” especially as you are not feeling great, but there you are slaving away on a Sunday to prepare something beautiful for us.